From being a mere hobbyist item, drones have become a major force in Philippine broadcast journalism, thanks to the pioneering efforts of Mr Public Service Kuya Daniel Razon. With these so-called “toys,” viewers can now have a glimpse of the actual event real-time scores of meters above the ground. As one of the veteran broadcast journalists in the Philippine, Kuya Daniel pioneered drone journalism – the use of camera drones for news gathering – to provide viewers with a fresh perspective in what has happened in a particular area. Through Kuya Daniel’s zeal to use the airspace to gather and broadcast news, UNTV News and Rescue, the media outfit that he is heading, has asked the nod of relevant government agencies, including the Civil Aviation Authority of the Philippines (CAAP) to fly drones legally for reporting. Last June 5, 2018, CAAP has just awarded UNTV News and Rescue the Operator Certificate of Registration, becoming the first TV station in the country to be granted this certification. 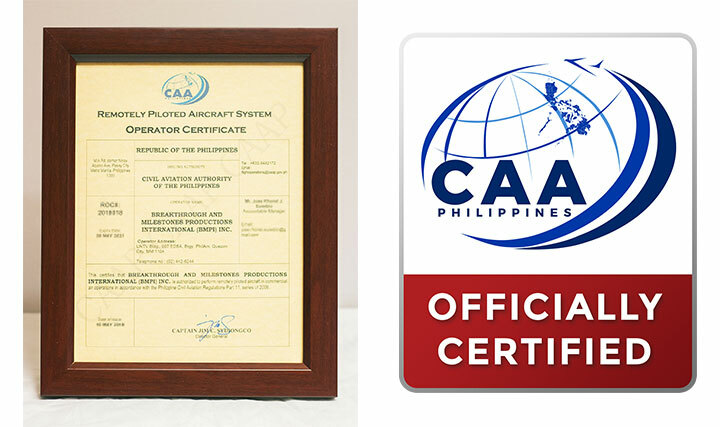 Being certified by the agency means the TV channel has the legal mandate “to ensure a safe, secure and green Philippine Sky” to operate aerial drones in the Philippine airspace. Xavier Lansang, a CAAP Regulations Officer, lauded UNTV’s initiative to comply with the government regulations on operating drones. “We would like to congratulate UNTV for being the first TV station to comply with the Civil Aviation Regulation and for receiving an operator certificate,” Lansang said in a UNTV interview. Foreseeing the need to get government accreditation to be able to operate legally, Kuya Daniel initiated the filing of the certifications and licensure from CAAP. “I foresee that later on there will be stricter regulations with regard to flying drones. So it is better early on that we are prepared for the safety [measures] and legalities.” Kuya Daniel said. To beef up the preparations for responsibly flying drones for journalistic and rescue purposes, Kuya Daniel launched UNTV Drone Academy, a learning institution for operators. All the network’s drone pilots, composed of cameramen and news reporters, have undergone intensive training by the said academy under the guidance of CAAP and by Kuya Daniel. After passing the training, all participants received licenses from the government agency. Even the aerial drones are CAAP-licensed with control numbers issued by the said agency. Meanwhile, Lansang urged other news agencies and media organizations in the country to follow UNTV’s lead in abiding by the legal requirements in operating the device. “We hope that all news agencies will follow your steps to also acquire a certificate which is also for the safety of our flying public airspace,” he said. Since 2013, when the first UNTV drone was flown to capture the magnitude of devastation left behind by Typhoon Yolanda (Haiyan) in Tacloban City, Leyte, drone journalism has covered various events that became part of Philippine history. Using high-resolution cameras, the UNTV drone has provided a bird’s eye view of recent events such as Boracay closure, Marawi siege, Benham Rise exploration, Laguna fish pen demolition, illegal mining in Zambales, Mayon Volcano explosion, and the 2018 Barangay and SK elections. Moreover, UNTV drones were instrumental in gathering and transmitting information that helped prevent calamities and save lives. These included nationwide earthquake drills, the annual Quiapo procession, accidents, fires, floods, and even the worsening traffic problem in Metro Manila. True to his moniker, Mr Public Service, Kuya Daniel is actively finding more ways that will amplify UNTV News and Rescue’s capacity to serve the public in the Philippines and other parts of the world. After launching drone journalism in the country, he is still on the lookout for fresh technologies that can be incorporated for the enhancement and upgrade of these flying gadgets.